2000 children from four schools will have the opportunity to get growing thanks to players of People’s Postcode Lottery. The charity Trees for Cities will create an Edible Playground at The Palmer Primary Academy in Reading and Baguley Hall Primary School in Manchester whilst Meridian High School and Fairchildes Primary School in Croydon will share an Edible Playground. The programme is a partnership between Trees for Cities, School Food Matters and Chefs Adopt a School to create 10 flagship Edible Playgrounds in London, Manchester, Birmingham, Leeds and Reading. Edible Playgrounds transform areas in school grounds into vibrant outdoor spaces that excite and teach children about growing and eating healthy food. By instilling healthy eating habits at an early age, Edible Playgrounds help tackle obesity, food poverty and lack of access to nature head on, and provide a platform for fun and engaging lessons that support the school curriculum. The edible playgrounds will be designed specifically for each school, but elements include raised beds for growing salads, root vegetables, brassicas soft fruits and herbs, fruit trees, a green house and a composting area. Pupils will enjoy planting and harvesting workshops throughout the year, and teachers will receive support to teach outdoors through gardening. The pupils will enjoy hands-on cooking lessons from Chefs Adopt a School and have access to food education programmes outside the school gate via charity School Food Matter’s Membership for Schools. School Food Matters will also support the schools to achieve their first Food for Life Award. Meridian High School and Fairchildes Primary School are two of Croydon’s Food Flagship Schools, supported by the Mayor of London. The schools are leading the way in inspiring and encouraging the communities of Croydon to grow and eat healthier food. The School’s Marketplace at City Hall, on Thursday 9th July, was a huge success, with 10 London schools battling their way through the London tube strike to arrive laden with produce to sell to the public. The standard of fresh produce and home-made products (such as preserves, cordials, edible plants etc) was extremely high. The students, from infants right through to secondary school, took the lead as professional sales people, confidently answering customer’s questions about the goodies they had on offer. During the School’s Marketplace the school’s had a surprise visit from the Mayor of London, Boris Johnson who visited every one of their stalls and went home with armfuls of school-grown produce. As you can imagine, the students (and teachers! ), were very excited to welcome this special guest. To see more photographs of the day visit our: Flickr photo gallery. 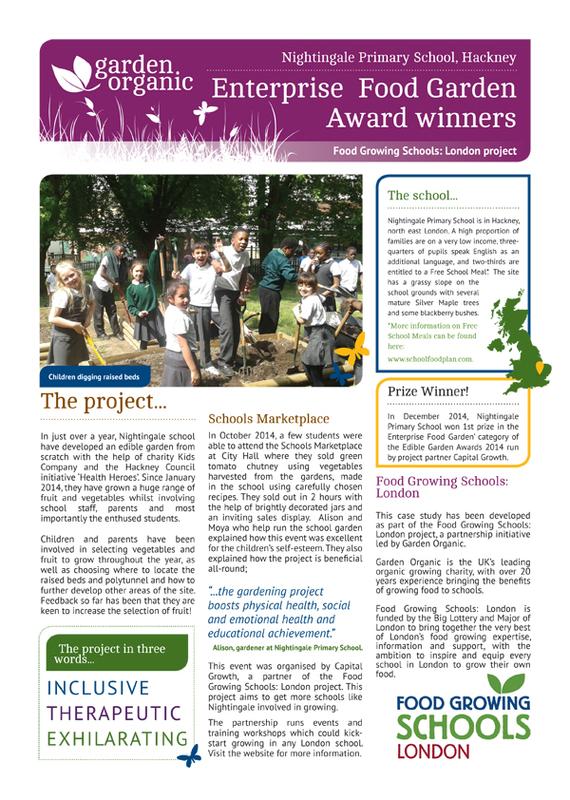 Grow Your Own School Garden Competition – Announcing the Winners! 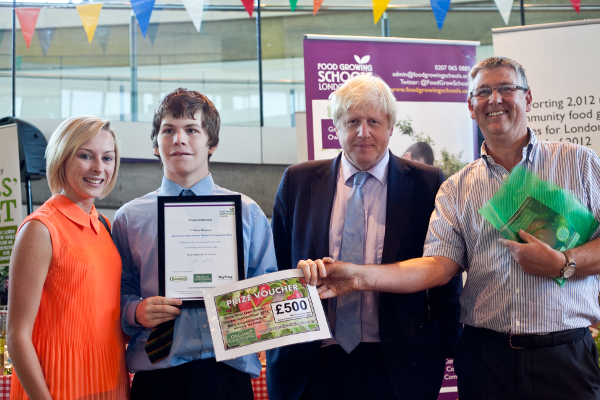 At the School’s Marketplace The Mayor of London also took part in giving out the prizes at our ‘Grow your Own School Garden Competition’ Award Ceremony, with our generous competition sponsors. A huge thank you to The Organic Gardening Catalogue, Haxnicks and VegTrug for donating the competition prizes, and to BBC TV Gardener, Chris Collins, for being our competition judge. The Schools Marketplace is organised by the Food Growing Schools: London partnership, led by Garden Organic, and Capital Growth. In 2014 schools sold produce to the Mayor of London, Boris Johnson, and Ireland’s Prime Minister Enda Kenny! The Mayor has formed a range of partnerships that are helping to transform London’s food environment. These include the Healthy Schools London awards programme, which incentivises the capital’s schools to adopt a whole-school approach to improving health by creating an environment which encourages growing and eating fresh, nutritious food. In addition the London Food programme has established two Food Flagship boroughs: Croydon and Lambeth, to demonstrate the impact on health and attainment achievable through improving food across the whole environment, using schools as a catalyst to drive this change. Rosie Boycott, Chair of London Food, said: “It’s fantastic to see the enthusiasm among teachers, children and parents around growing and eating fresh, healthy food in schools. As well as produce stalls, an award ceremony for the exciting new Grow Your Own School Garden Competition will take place at 1.30pm. Judged by BBC TV Gardener Chris Collins, the competition is aimed at London schools that aren’t yet growing food. Eligible schools were tasked with setting up a school gardening group, planning a new school growing space, identifying community support and making a gardening equipment wishlist. The three London schools that have been shortlisted to win are: Our Lady of Grace Catholic Infant School (Brent); Richard Challoner School (Kingston) and Richmond Park Academy (Richmond). See main body of press release for: Chris Collins (BBC TV Gardener) and Michael Hedges, Managing Director, Chase Organics and The Organic Gardening Catalogue. ‘We are delighted to support the Food Growing Schools Project. It is essential for our future that our children get a hands on chance to grow food and plants in general. We work tirelessly around the world promoting grow your own and healthy eating and the London Schools Project is something we want to encourage as much as we can. Well done to everyone involved.’ Joe Denham, CEO for VegTrug Limited. Food Growing Schools: London – Growing Ideas. Sowing Inspiration. Cultivating Futures. The Greater London Authority (GLA) is happy to be supporting Food Growing Schools: London (FGSL) to deliver a series of food growing training workshops in Croydon and Lambeth schools, and one to one support to 15 schools in Croydon that are not already food growing. The School Food Plan has produced practical guidance to help school leaders and governing bodies adopt a whole school approach to food and create a culture and ethos of healthy eating. It is designed to be used alongside other School Food Plan resources including the Headteacher Checklist and What Works Well website. Ofsted, which we consulted in developing the guidance, will be making this document available to inspectors in their training. Download on our Resources page. …but we are fixing it! In case you didn’t watch the launch or haven’t seen the news, we are sad to announce that on Sunday afternoon the SpaceX-7 rocket exploded, along with our seeds and other precious cargo, shortly after take-off. The rocket was unmanned and broke up in the air so no one was harmed. We always knew that there was a chance that whatever vehicle the seeds flew on it might experience a problem, as this is the nature of space flight. This is one of the reasons why we decided to send the seeds up many months before Tim Peake himself arrives at the International Space Station later this year. It also means that these seeds will be highly prized when they finally make their epic journey! We have already procured more rocket seeds from the same British seed company Tozer Seeds, and are working with the UK Space Agency and European Space Agency to get these seeds on one of the next available cargo launches. The rest of the project will continue on the same timeline so we will still open up official registrations in September and seeds and resource packs will be sent in spring 2016. Schools should continue to register their interest in the project and be the first to apply for seeds here. We will keep you updated with progress as we continue. Please keep an eye on our website and follow @RHSSchools on Twitter for more information. In the meantime, you can watch the rocket’s failed launch on YouTube here and for more detailed information on SpaceX-7 and the failed launch, please read the UK Space Agency blog here.